Istanbul gets more rain than London, though it doesn’t have the reputation for it. Still, upon my arrival, a steady drizzle was making my choice of wearing shorts and sandals a poor one. I upgraded my dress and later even added a sweater and went in search for baklava. One new addition since my previous visit is the excellent metro connecting the airport with the edge of downtown Istanbul, for a mere 2 Lira, some 85 eurocents, though the machine issuing the tokens did eat on of my lira first. Also good, close to the entrance, a supermarket selling heaps of baklava. 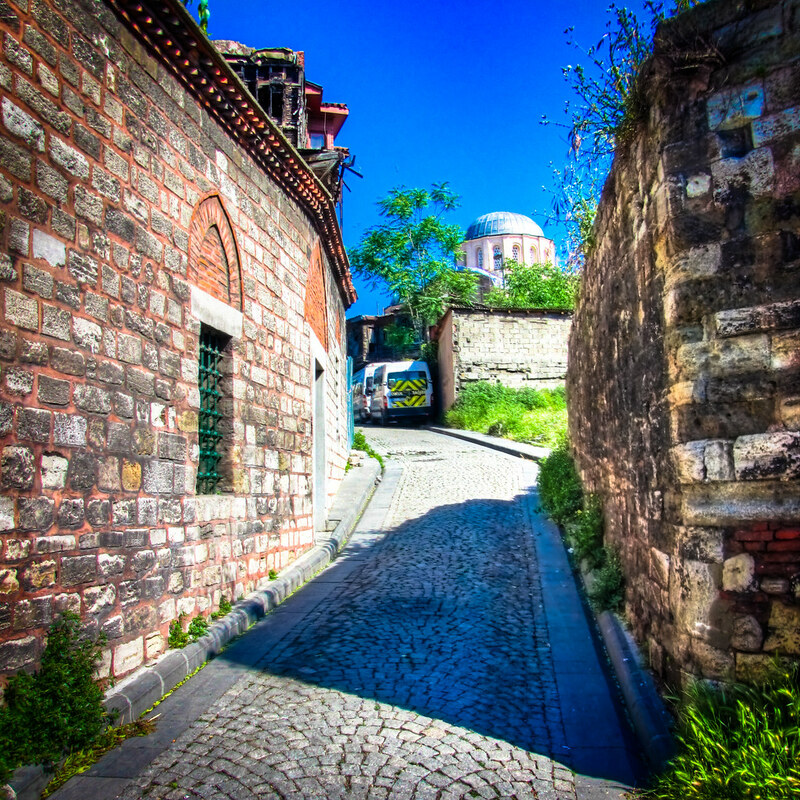 I’m staying in an area called Fatih, where I found a place calling itself “Best place in Istanbul’s old city” through Airbnb. It’s nice, but maybe that’s overdoing it a tad bit. Airbnb will be the death of the conventional hostel. I’m paying 15 euros for a double room in a private home, comparable to the price of a hostel bed in a dorm. Sure, you don’t get the same social experience, but the advantages are legion. 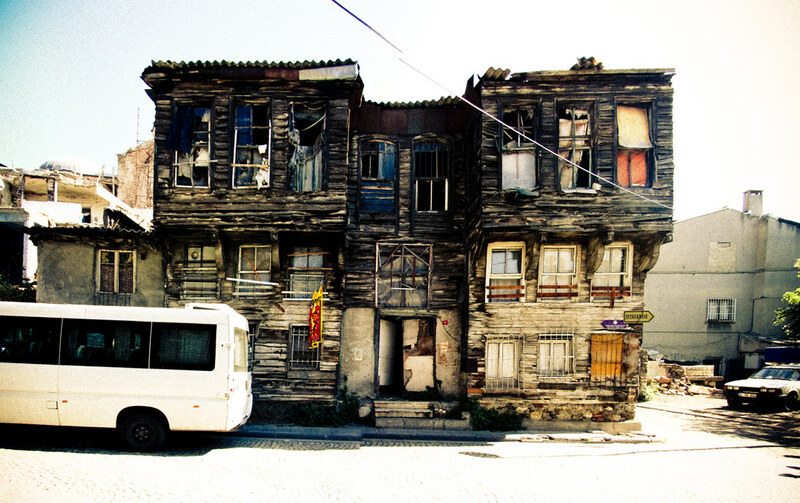 Inside the suburb of Fatih, there’s the sub-suburb of Zeyrek, a world heritage site where dilapidated wooden houses are stacked on top of each other, fairytale like, at almost impossible angles. And kitties! So many kitties! Dinner was had at the excellent Fatih Karadeniz Pidecisi, serving Turkish pizza. A Turkish pizza is most often oblong, somewhat shaped like a human eye, with upstanding edges. The fillings are typically cheese, meat and, more often than not, a soft fried egg. Mine was served with a stick of butter. Next to me, three men ordered four pide, where the sides were so much standing up, that they touched along the length of the pizza, except for having a small hole in the middle. They threw in their sticks of butter, picked up the pizza at both ends and proceeded to rock their pizzas back and forth, letting the melted butter slide from one end of the pizza to the other. Then, pizzas were wolfed down. I was a bit surprised at the cost of my meal, pide now apparently going for upwards of 10 lira, about 4.50 euro. Restoring my faith in economic disparity, though, my breakfast the next day, of a big toasti, ayran en tea, was a mere four lira, not even two euros. Closeby, also the seemingly only Greek Orthodox church not converted to a mosque after the takeover of Constantinopel by the Turks in 1453. The oddly named Church of St. Mary of the Mongols was already a church and nunnery from the 7th century onwards, but only achieved its later prominence in the late 13rth century, when one Maria Palaiologina rebuilt the church and nunnery after herself having been away for 15 years. She returned to Istanbul because her husband had died. Her husband being the khan of the ilkhanate, the portion of Chinggis’ empire centered around Persia. Hence the name.